With the Datoclip pockets, folders and files and its patented pocket top you can find the records to a file quickly and reliably. Labels, scheduling strips and signal tabs are available in different colours to clearly distinguish between jobs/categories etc. The patented clip mechanism allows easy and quick replacement of pocket tops and pocket. Remind on all important appointments. The transactions can be managed according to their individual space requirement in pockets, files or folders. The pocket top takes both, metal and plastic signals. They can be moved independently from each other on different levels. 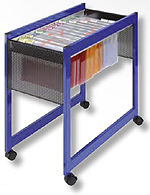 Our organisational furniture is available in different versions fitting your requirements from a mobile trolley to drawer cabinets. Please contact us for your inidvidual requests concerning colours and sizes. A traveller scheduling bar for easy and clear control of deadlines or dates is optionally available.